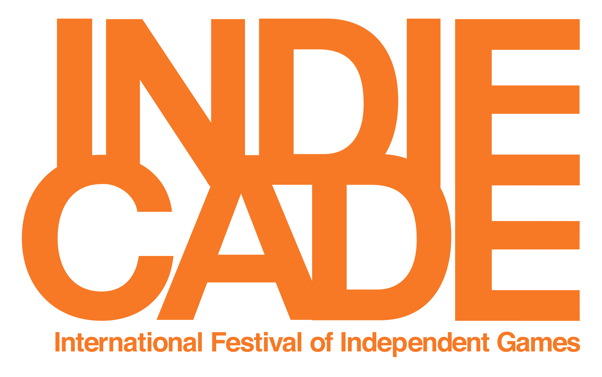 This past weekend, I was fortunate enough to attend IndieCade 2015 in Culver City. 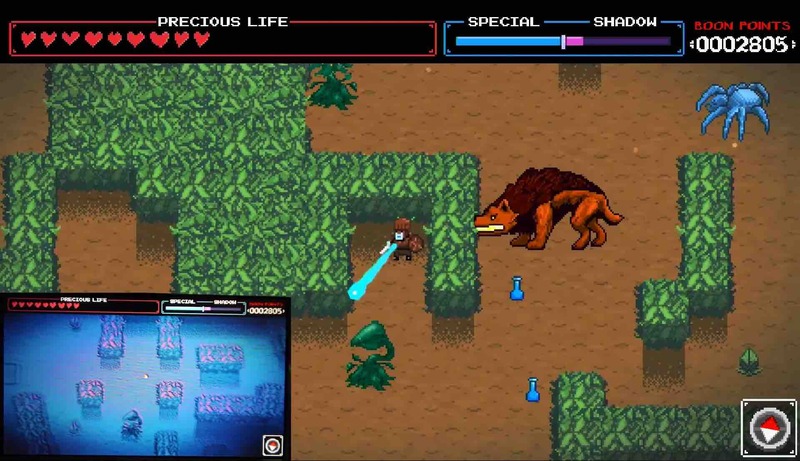 For those not in the know, IndieCade is essentially the Sundance of video games, with independent developers from around the world showing off their latest projects. On display were a menagerie of different genres with an even wider array of platforms. I met some interesting people and played their fascinating games, and I was blown away by what I saw. Here are some upcoming titles that you should definitely keep on your radar. Note that due to the nature of independent game production, solid release dates do not exist. 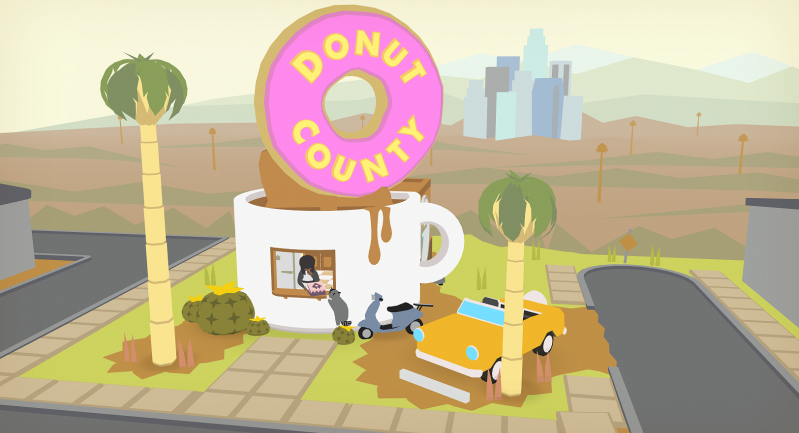 Developed entirely by developer Ben Esposito, DONUT COUNTY was a crowd favorite at IndieCade. You might know Ben from his collaboration on the bizarro SONIC DREAMS COLLECTION that appeared out of nowhere a few months back, and that creativity is again evident in his latest title. DONUT COUNTY is best described as an inverse KATAMARI DAMACY. While sharing the bright, cheery visuals and tone of the Japanese puzzler, DONUT COUNTY eschews the ever growing Katamari ball for a voracious Donut. Unlike a Krispy Kreme, however, this donut is a black hole that players drag across the ground, swallowing objects above it. As more people and items fall inside, the hole grows larger. The Donut can assume elemental properties as well, becoming a furnace if it swallows a campfire, or a pool if it absorbs a puddle. Characters that fall into the Donut will appear as customers inside the eponymous donut shop that you own, ensuring that the hub world is always expanding. You can expect DONUT COUNTY to release in late 2015. The highlight of my trip to InideCade’s VR tent was without a doubt Sunken Places’ CLASSROOM AQUATIC. Players assume the role of a foreign exchange student studying underwater at a dolphin high school. Unlike your hyper-intelligent, undersea classmates, you did not study for the upcoming test, which means that you’ll have to cheat. Using the Oculus Rift headset, the player must peek at another student’s test to copy their answers, all while avoiding getting caught by them or the teacher, Mr. Porpoise. Bottlenose anatomy means that your fellow students have impressive peripheral vision, making your answer borrowing a calculated risk. 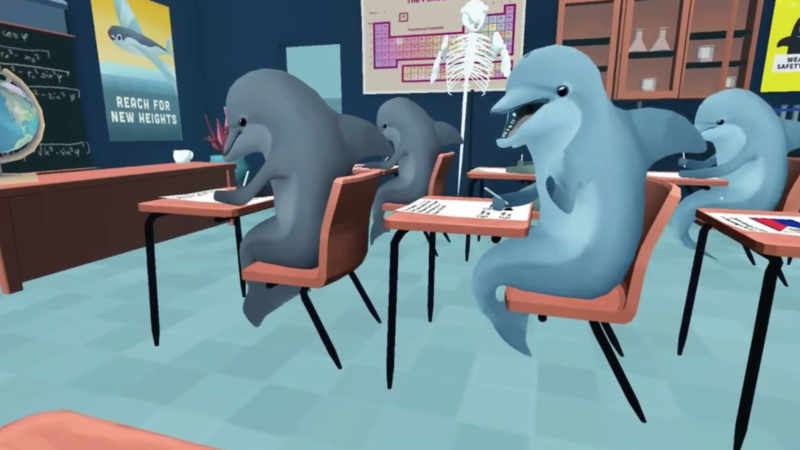 Distractions can be caused by throwing erasers at objects or dolphins, but getting caught or failing to turn in your exam after five minutes will cause the player to flunk the class. Sunken Places touts CLASSROOM AQUATIC as the Oculus’ first stealth trivia, and while that classification alone sets a precedent, the game may be the most immersive VR experience in development. CLASSROOM AQUATIC is aiming for a Q2 2016 release date. Possibly the most ambitious game at IndieCade, TWELVE MINUTES is another one-man job helmed by Luis Antonio. TWELVE MINUTES sees working man protagonist Aaron coming home to a dinner prepared by his wife. After a few minutes, a cop will enter the single-bedroom apartment and arrest Aaron. After twelve minutes, however, Aaron wakes up immediately after he entered his home. This process is repeated ad infinitum, with Aaron remaining conscious throughout the experience. If Aaron attempts to leave the apartment, the loop will restart. Using clues he retains from each time loop, Aaron must figure out what is going on in order to escape. The concept is similar to LIFE IS STRANGE, but while that game skewed towards THE BUTTERFLY EFFECT, TWELVE MINUTES is more similar to the Bill Murray escapade GROUNDHOG DAY. Each loop lasts twelve minutes in real time, and players will have to memorize when and where each event happens. There are a crazy number of variables, ranging from when phone contacts will answer calls to whether your wife hears you come in or not. The possibilities for experimentation are absolutely tantalizing. You should be able to crack the enigma of TWELVE MINUTES yourself in Q3 2016. TEMPLE OF YOG is CHUDCHUD Industries’ soon-to-be-released episodic roguelike dungeon-crawler coming out on the Nintendo eShop. If that description made you scratch your head, you’re not alone. In TEMPLE OF YOG, you control a human tribute from one of four guilds, determining their class. Your Mage, Cleric, Warrior, or Assassin will enter the Temple Portal to their certain death, waging battle against the monsters inside. Once a tribute dies, the points they earned in their run are tallied up to determine the worthiness of their sacrifice. The game then returns to the village outside the temple, where the player selects the next tribute to enter the portal. Points earned inside the portal are spent on upgrades for each of the four guilds, which affect the stats of all future tributes from that faction. In addition, accruing enough sacrifices will cause the village to advance to the next epoch, with more epochs becoming available in future updates. Within the portal, TEMPLE OF YOG utilizes the dual screens of Nintendo’s platforms in the form of the Shadow Realm. Map layouts differ between the Light Realm and Shadow Realm, with certain enemies and items only appearing in certain planes of existence. Tributes can shift between realms on the go, using the bottom screen to preview what the other realm looks like before switching. Players can travel between realms to escape enemies and reach inaccessible areas. Quests and dungeons are randomly generated, ensuring the process of human sacrifice never becomes stale. TEMPLE OF YOG is set to release in December of 2015 on Wii U, with a 3DS version slated to come afterwards. Finji’s tactical survival game OVERLAND excites me on multiple levels. The game is probably best described as XCOM meets Cormac McCarthy’s THE ROAD. 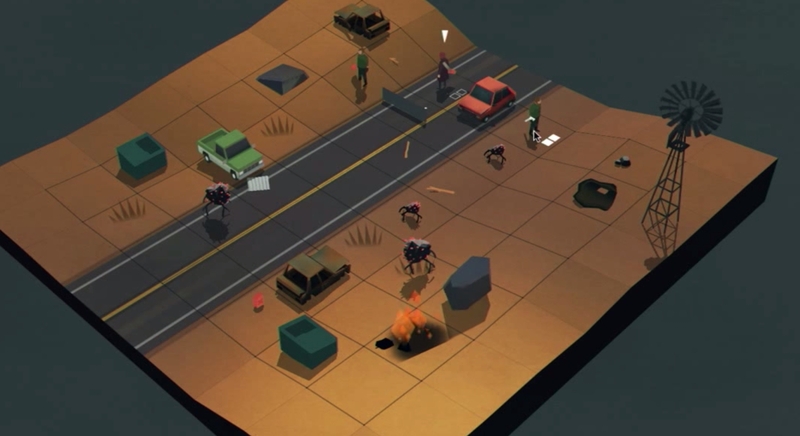 The player guides a group of survivors on a roadtrip across post-apocalyptic America. During encounters along the way, survivors take turns gathering supplies and clearing paths for their vehicle to progress. Unfortunately, the land is rife with sound-sensitive, subterranean, flesh-eating monsters, and the humans will have to stick close to survive. From campsites, the survivors plan their route, either taking the most direct route, or choosing dangerous but potentially profitable detours. Fuel, car space, and survivor health and aptitudes are all factors that need to be considered when deciding each action, with permanent deaths and randomized environments keeping the player on edge. OVERLAND will be rolling through digital retailers sometime in 2016. The OXENFREE station was swarming with onlookers at IndieCade, and with good reason. This is developer Night School Studio’s first game, but their team includes veterans from both Telltale Games and Disney, which is reason enough to get excited. OXENFREE stars Alex, your typical, bubblegum blue-haired girl, who decides to spend the night with her friends on an abandoned military test site. 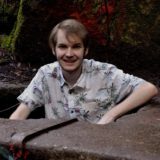 Of course, strange things start to happen in the form of some spooky anomalies that appear in response to the frequency on Alex’s portable radio. Trapped without phone service, the teens need to figure out the island’s supernatural secret if they’re to see the next morning. In addition to light platforming elements, Alex can whip out her radio at any time and tune into radio stations or discover sources of anomalies. 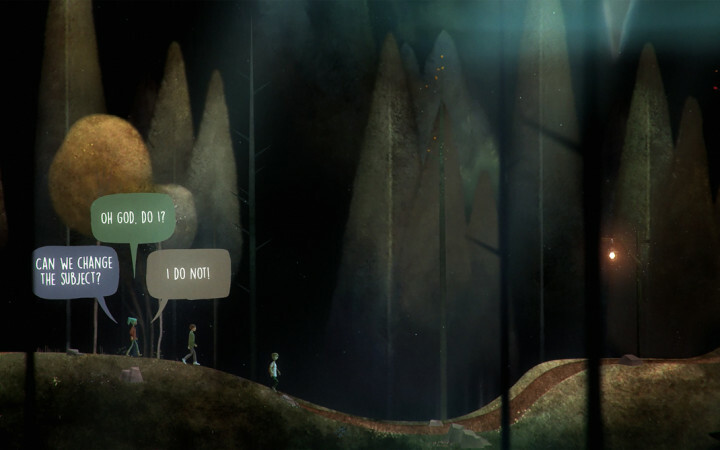 The most impressive aspect of OXENFREE, however, is its dialogue system, which features multiple characters speaking simultaneously. The player can interrupt, or be interrupted, depending on when they choose to respond. When the group begins to freak out, they’ll start talking over each other, encouraging the player to think not only about what they say, but when. Tune in at the start of 2016 for OXENFREE’s launch.